The Orlando Magic are an American professional basketball team based in Orlando, Florida. The Magic compete in the National Basketball Association (NBA) as a member of the league's Eastern Conference Southeast Division. The franchise was established in 1989 as an expansion franchise, and such notable NBA stars as Shaquille O'Neal, Penny Hardaway, Patrick Ewing, Grant Hill, Tracy McGrady, Steve Francis, Dwight Howard, Vince Carter, Rashard Lewis, Dominique Wilkins, and Hedo Türkoğlu have played for the club throughout its young history. As of 2017[update], the franchise has played in the NBA playoffs for exactly half of its existence (14 playoff appearances in 28 years), and twice went to the NBA Finals, in 1995 and 2009. Orlando has been the second most successful of the four expansion teams brought into the league in 1988 and 1989 in terms of winning percentage, only after the Miami Heat. In September 1985, Orlando businessman Jim L. Hewitt approached Philadelphia 76ers general manager Pat Williams as they met in Texas on his idea of bringing an NBA team to Orlando. Intrigued by the project, Williams signed on as the front man of the investment group one year later as he left the 76ers. On June 19, 1986, the two held a news conference to announce their intention of seeking an NBA franchise. At the same time Hewitt and Williams decided to hold a contest in the Orlando Sentinel newspaper to get names for their new franchise. Out of a total of 4,296 submitted entries, the names were subsequently narrowed to four, "Heat", "Tropics", "Juice", and "Magic". The last one, which had been submitted by 11 people, was picked after Williams brought his 7-year-old daughter Karyn to visit in Orlando. On July 27, 1986, it was announced that the committee chose the Magic to be the new name of the Orlando franchise in the NBA. The name "Magic" alludes to the area's biggest tourist attraction and economic engine Walt Disney World, along with its Magic Kingdom. Hewitt added that "You look at all the aspects of Central Florida, and you find it really is an exciting place, a magical place." Many, including Williams himself at first, thought that Miami or Tampa were better locations in Florida for a franchise, given Orlando was a small town lacking a major airport and a suitable arena. Hewitt brought investors such as real estate developer William DuPont, Orlando Renegades owner Don Dizney, and Southern Fruit Citrus owners Jim and Steve Caruso, and talked the Orlando city officials into approving an arena project. Meanwhile, Williams gave presentations to NBA commissioner David Stern and the owners of the other teams of the league that the town was viable. The Magic were one of the four new expansion franchises awarded by the NBA in 1987 along with the Charlotte Hornets, Miami Heat and Minnesota Timberwolves. Initially, the NBA was planning to expand by three teams, with one franchise going to Florida; however, when both Miami and Orlando ownership groups made successful pitches, the expansion committee decided to expand by four teams, allowing both to have a franchise. The Magic became the first ever major-league professional sports franchise in the Orlando area, following an expansion fee of reportedly $32.5 million. The Magic hired Matt Guokas as the team's first coach, who helped the Magic select 12 players in the NBA Expansion Draft on June 15, 1989. On June 27, 1989, the Magic chose Nick Anderson with the 11th pick in the first round, who became the first draft pick of the franchise. The very first game played was an exhibition game on October 13, 1989 against the then reigning champions Detroit Pistons, which the Magic won. Anderson was quoted as saying the atmosphere and the people watching the game was "like Game 7 of the NBA Finals". On November 4, 1989, the Magic played their first season game at the Orlando Arena (O-Rena) against the visiting New Jersey Nets, who won 111–106 in a hard-fought game. The Magic's first victory came two days later, as the Magic defeated the New York Knicks 118–110. The inaugural team compiled a record of 18–64 with players including Reggie Theus, Scott Skiles, Terry Catledge, Sam Vincent, Otis Smith, and Jerry Reynolds. In the 1990 NBA draft, the Orlando Magic selected Dennis Scott with the fourth overall pick. On December 30, 1990, Scott Skiles racked up 30 assists in the 155–116 victory over the Denver Nuggets, breaking Kevin Porter's NBA single-game assists record (29). Skiles was named the NBA's Most Improved Player at the end of the season, as the Magic heralded the NBA's most improved record that season. Forward Dennis Scott set a team mark with 125 three-point field goals for the season, the best long-distance production by a rookie in NBA history. He was named to the NBA All-Rookie First Team. Despite a 31–51 record, there were 40 sellouts out of 41 home games. On September 19, 1991, the DeVos family, founders of Amway, purchased the franchise for $85 million. Family patriarch Richard DeVos became the owner of the franchise. The 1991–92 season was disappointing for the Magic as various players missed games with injuries. Dennis Scott played only 18 games, Nick Anderson missed 22 games, Stanley Roberts, Jerry Reynolds, Brian Williams, Sam Vincent and Otis Smith all missed at least 27 games each. With a shortage of healthy players the team struggled through a 17-game losing streak and finished with a 21–61 record. The Magic still managed to have all 41 home games sold out. The Magic history was changed on May 17, 1992, when the franchise won the first pick in the 1992 NBA draft Lottery. The Magic selected big-man Shaquille O'Neal from Louisiana State University, the biggest prize in the draft since the Knicks won Patrick Ewing. O'Neal, a 7'1" center, made an immediate impact on the Magic, leading the team to a 41–41 record. The Magic again became the NBA's most improved franchise, as they improved by 20 games. O'Neal was the first rookie to be voted an All-Star starter since Michael Jordan in 1985. He also became the 1992–1993 NBA Rookie of the Year. Despite O'Neal's presence, the Magic missed the 1993 NBA Playoffs because they were tied with the Indiana Pacers for the eighth and final playoff spot in the Eastern Conference with the Pacers holding the tiebreaker. Despite barely missing the playoffs and receiving the least chance of gaining the top draft pick with only one ball in the lottery, the Magic again won the first pick in the 1993 NBA draft Lottery. Prior to the draft, Guokas stepped down as head coach, and Brian Hill was promoted to become the Magic's second head coach. In the draft, the Magic selected Chris Webber, but traded him to the Golden State Warriors for the number three pick, guard Anfernee "Penny" Hardaway and three future first-round draft picks. With the combination of O'Neal and Hardaway, the Magic became a dominant team in the NBA, compiling the first 50 win season in franchise history with a 50–32 record. The Magic were in the playoffs for the first time, ranked the fourth seed in the Eastern Conference; however, the Pacers swept the Magic 3–0 in the first round, thus ending the Magic's season. In the 1994–95 season, the Magic's sixth season, All-Star forward Horace Grant was acquired as a free agent from the Chicago Bulls. The Orlando Magic compiled a 57–25 record, best in the East and winning the Atlantic Division title, becoming the second-fastest team (behind the Milwaukee Bucks in 1971, who were in their third season) to advance to the NBA Finals in league history. In the playoffs, the Magic defeated the Boston Celtics, Bulls, and the Indiana Pacers, advancing to the NBA Finals where O'Neal, Hardaway and the young Magic bowed to a more playoff-experienced Hakeem Olajuwon and the Houston Rockets, winning their second consecutive championship in a 4–0 sweep of Orlando. In the 1995–96 season, the Magic again were near the top of the Eastern Conference and the Atlantic Division with a 60–22 record, led by O'Neal and Hardaway; however, the Magic were seeded number two, behind the NBA's all-time second best 72–10 record of the Chicago Bulls. In the meantime, general manager Pat Williams was promoted to senior executive vice president and replaced by the vice president of Basketball Operations John Gabriel on April 29, 1996. In the playoffs, after the Magic defeated the Detroit Pistons and the Atlanta Hawks, Orlando met the Bulls in the Eastern Conference Finals. The combination of Jordan, Scottie Pippen and rebounder Dennis Rodman was too much for the Magic, and Orlando was swept 4–0. In the offseason, O'Neal left as a free agent to the Los Angeles Lakers, dealing a huge blow to the Magic franchise. In the middle of the season, urged by player discontent, management fired coach Brian Hill and named Richie Adubato as interim coach for the rest of the season. Under Adubato, the Magic went 21–12 to compile a 45–37 record, led by Penny Hardaway. In the playoffs, the Magic quickly fell 0–2 to the heavily favored Miami Heat in the first round, but Hardaway battled back with consecutive 40 point games to assure a game five (the first player to do so), which the Magic ultimately lost. The Magic then hired Chuck Daly to be head coach for the 1997–98 season. In addition, Hall of Famer Julius Erving joined the Magic's front office, giving Orlando hope for a successful season. The season was hampered by an injury to Hardaway who sat out the majority of the season. Anderson, combined with newly acquired free agent Bo Outlaw, led the team to a 41–41 record, just out of reach of the NBA playoffs. In addition, Seikaly was traded during the season to the New Jersey Nets for three role players and a future draft pick. In 1998–99, with the drafting of Michael Doleac and Matt Harpring with the 12th and 15th picks in the 1998 draft, and a healthy Penny Hardaway and Nick Anderson, the Magic tied for the Eastern Conference's best record with the Miami Heat in the lockout-shortened season, 33–17. Armstrong again led the team emotionally, winning the NBA's Sixth-Man and Most Improved Player awards. Orlando also acquired NBA great Dominique Wilkins, along with brother Gerald, who were past their primes but were both still serviceable NBA players. In the playoffs the Penny Hardaway-led Magic were seeded number 3 because of tiebreakers and faced the Philadelphia 76ers. The 76ers, led by Allen Iverson, upset the Magic 3–1 in the first round. The team also changed their uniforms for the first time ever, changing from pinstripes to stars. In 1999, the Magic, under general manager John Gabriel, who was later named Executive of the Year, hired rookie-coach Doc Rivers. Gabriel dismantled the previous team trading their only remaining superstar Anfernee Hardaway to the Phoenix Suns for Danny Manning (who never donned a Magic uniform), Pat Garrity, and two future draft picks. The Magic were then a team composed of virtually all no name players and little experience which included team captain Armstrong, Bo Outlaw and a young Ben Wallace, along with Coach Rivers led the Magic to a 41–41 record, barely missing out on the playoffs. At the end of the season Rivers was named Coach of the Year. That year was characterized by the slogan "Heart and Hustle", as the team was known for its hard-working style. Tracy McGrady with the Orlando Magic in 2002. The following offseason, Gabriel, with millions of cleared salary cap space, attempted to lure three of the NBA's most prized free agents: Tim Duncan, Grant Hill, and Tracy McGrady. Duncan opted to remain with the San Antonio Spurs, the Magic acquired Hill, a perennial All-Star, and McGrady. With McGrady and Hill together, the Magic were expected to be a force in the East. However, Hill was limited to 4 games because of an ankle injury. McGrady blossomed into a star during the season, becoming one of the NBA's top scorers. With the addition of Mike Miller from the draft, the Magic compiled a 43–39 record, which included a nine-game winning streak, and once again made the playoffs. McGrady made the All-Star Team and All-NBA 2nd Team. Miller won the Rookie of the Year. In the playoffs, they faced the Milwaukee Bucks in the first round. The Bucks won the series 3–1. In 2001–02, McGrady led the Magic to a winning record of 44–38. Hill was still severely limited by his ankle injury, and did not play for the vast majority of the season. McGrady, combined with Armstrong, Miller, and 3-point sharpshooter Pat Garrity, formed the core of the team. McGrady made the All-NBA for the first time and made his second consecutive All-Star Team. However, the Magic were defeated 3–1 in the first round of the playoffs by the Charlotte Hornets led by Baron Davis. In 2002–03, with the acquisitions of Gordan Giricek and Drew Gooden from the Memphis Grizzlies in exchange for Mike Miller, McGrady once again led the Magic to a 42–40 record. McGrady led the league in scoring with 32.1 ppg, made his second All-NBA 1st Team, and 3rd All-Star Team. Despite still not having Hill due to injury, the Magic entered the playoffs for the third straight year. However, after taking a 3–1 lead in the best-of-seven first round series, the Magic fell to the Detroit Pistons 4–3 in the now infamous heartbreaker. McGrady was quoted as saying, "It feels good to get in the second round" after still needing one more win to advance. The Magic's 15th season in 2003–04 proved to be one of its toughest ever. Even with the acquisition of veteran free agents Tyronn Lue and Juwan Howard, the Magic struggled early. After winning its first game, the Magic lost 19 consecutive games, setting a franchise record. They finished an NBA worst 21–61. Despite this, McGrady led the league in scoring with 28.0 ppg, made the All-NBA 2nd Team and his 4th consecutive All-Star Team. In the middle of the 19-game losing streak, coach Doc Rivers was fired, and assistant Johnny Davis was promoted to head coach. General manager Gabriel was replaced by John Weisbrod. In the off-season, Weisbrod completely dismantled the team. Though he kept Davis as coach, he shook up the player roster, only keeping a few players from last season. The most significant trade was Tracy McGrady. McGrady, discontent with the Magic, wished to move on; Weisbrod accused McGrady of "slacking off" and not attending practices (McGrady later admitted that he did not give 100% during the 2003–2004 season and wanted the team to bring him some help, but never wanted to leave Orlando). The Magic traded McGrady along with Reece Gaines, Tyronn Lue, and Juwan Howard to the Houston Rockets for Steve Francis, Kelvin Cato, and Cuttino Mobley. In addition, the Magic acquired center Tony Battie and two second-round draft picks from the Cleveland Cavaliers in exchange for Drew Gooden, Steven Hunter, and the draft rights to Anderson Varejão. The Magic then signed free agent Hedo Türkoğlu. With the number one draft pick, the Magic selected high-school phenomenon and future All-Star and franchise cornerstone Dwight Howard, and a draft day trade with the Denver Nuggets got them point guard Jameer Nelson. After a promising 13–6 start, the Magic began to fall apart. First, Weisbrod traded Mobley for Doug Christie from the Sacramento Kings. Christie, because of his emotional ties to the Kings, at first refused to play for the Magic. Later on, Christie claimed he had bone spurs and was placed on the injured list after playing only a few games for the Magic. Near the end of the season, with a playoff-push faltering, Weisbrod fired Davis after leading Davis to believe he was going to be the team's head coach for the entire 2004–05 NBA season. He then promoted Chris Jent to interim head coach. Throughout the season, bolstered by Hill's return, the Magic played spectacularly, defeating top NBA teams. However, led by the erratic play of Francis, the Magic also lost to league teams with losing records. Howard showed great promise, becoming one of the few players to average a double-double. Howard was a consistent rebounder and scorer, becoming the first rookie to start and play all 82 games in a season. In addition, Nelson, after a slow start, developed into a talented player, taking over the starting point guard position. Hill also returned and averaged 19.7 points a game. Hill was chosen an All-Star starter by NBA fans for the 2005 All-Star Game, and Dwight Howard and Jameer Nelson were named to the All-Rookie first and second teams, respectively. Howard was a unanimous selection. The Magic finished the season 36–46. Their playoff push was hampered by injuries in the last quarter of the season: a season-ending broken wrist for sixth man Hedo Türkoğlu, a shin injury to Grant Hill, a rib cage injury to Nelson, and a three-game suspension to Francis for kicking a photographer. The Magic ended a few games out of the playoffs. On May 23, 2005, the Magic's plans were disrupted by the abrupt resignation of general manager and Chief Operating Officer John Weisbrod. In addition, the Magic announced the following day that Brian Hill, the coach who led the Magic to the NBA Finals under O'Neal and Hardaway, would return as head coach. The Magic drafted Spanish Fran Vázquez with the 11th pick in the 2005 NBA draft. On July 28, 2005, Vazquez stunned the team after announcing that he would remain in Spain to play for Akasvayu Girona, getting ridiculed by media after he was quoted that the decision to stay was made by his girlfriend. Owner Rich DeVos announced on October 21 that he was transferring ownership to his children, with the official owner role moving to son-in-law and team president Bob Vander Weide. The transfer was supposed to be complete by the end of the year. The 2005–06 season opened with high hopes for the Magic despite not being able to add first round draft pick Vasquez. Grant Hill was supposedly finally healed from his multiple ankle surgeries. Dwight Howard and Jameer Nelson showed excellent progress during summer-league play. Second round draft pick Travis Diener showed excellent shooting and decision making during the summer. And the free agent signing of Keyon Dooling showed that the club was going to continue making progress. Then trouble began. Hill, despite his ankle apparently being healed, suffered a painful sports hernia injury that would hamper his play throughout the entire season. After playing in three preseason games, he underwent surgery to correct the hernia and would not appear during the regular season until mid-December, to which he lasted a month before attempting to make another comeback in February and early March, however he only played sporadically. Then a foot injury to Nelson forced him to sit out over a month. On February 15, 2006, the Magic announced that they had acquired Darko Miličić and Carlos Arroyo from the Detroit Pistons in exchange for Kelvin Cato and a 2007 top-five protected first-round draft pick. One week later, on February 22, the Magic announced that they had traded Steve Francis to the New York Knicks in exchange for Anfernee Hardaway (whom they waived two days later) and Trevor Ariza. With a set starting rotation of Battie, Howard, Türkoğlu, DeShawn Stevenson, and Nelson, the Magic mounted a surprising run at the eighth playoff spot in the Eastern Conference, including an 8-game winning streak and 12 consecutive home wins. The streak included wins against NBA powerhouses Detroit, San Antonio, Dallas and Miami, as well as a game against the Philadelphia 76ers in which Howard recorded 28 points and a career-high 26 rebounds. Despite their efforts they did not make the playoffs. With the 11th overall pick in the 2006 NBA draft, the Magic took the former Duke star JJ Redick. Even with the fan support to get him playing time he averaged just over 11 minutes a game. After beginning the season strong with a 13–4 record, the Orlando Magic began to suffer in the standings as the result of multiple losses, due in large part to the injuries of Tony Battie, Keyon Dooling, and Grant Hill. The Magic were also hampered with the sporadic play of many of their young stars, who on multiple occasions showed their propensity for streaky shooting and the team's lack of a solid scoring two-guard. Despite the team's poor play, Dwight Howard continued to develop and blossom in his third year in the league, culminating in his first selection to the Eastern Conference All-Star team. The final few weeks of the season saw the Magic build momentum and confidence with an impressive late push towards the Playoffs. On April 15, 2007, with an 88–86 victory over the Boston Celtics, the Magic secured its first berth in the NBA Playoffs since 2003 by locking up the 8th seed in the Eastern Conference. This marked the first time that the team had made the playoffs while posting a losing record. Nevertheless, their Playoff run ended on April 28, 2007 after they were swept in the first round by first seeded Detroit Pistons whose experience, veteran leadership and ability to consistently make the clutch basket proved far too much for the undermanned and overwhelmed Magic to overcome. It was announced on May 23, 2007, that Brian Hill had been fired as head coach of the Magic. On June 1, 2007, the Magic signed Billy Donovan to be their head coach for five years. The next day, Donovan wished to be released from the contract and the Magic agreed several days later. On June 6, 2007, the Magic signed a 4-year contract with Stan Van Gundy. In the free agent market, the Magic signed Rashard Lewis of the Seattle SuperSonics to a six-year league-maximum contract believed to be worth over $110 million. At the NBA China Games, the Magic swept the three games in China, twice against the Cleveland Cavaliers and once against the Chinese national team in games held in Shanghai and in Macau. On November 15, 2007, Bob Vander Weide, the son-in-law of Richard DeVos, officially took over as owner of the team, although ownership is still split evenly amongst Richard DeVos' other children as well. The Magic started the 2007–08 NBA season with an impressive 16–4 record in their first 20 games, which included wins over the Boston Celtics and Cleveland Cavaliers. Through the next few months, the Magic were not so successful, splitting their next 36 games with 18 wins and 18 losses. At the start of March, the Magic seemed to pick up speed again, finishing the month with 10 wins, the first time since November that they won 10 or more in a month. The Magic clinched the Southeast Division title when the Washington Wizards were routed at Utah 129–87 on March 31, 2008. It was the Magic's third division title, but only their first since 1995–96 season, as well as their first since the Southeast Division was formed. They also earned their 50th win of the season against the Chicago Bulls on April 13, which had not happened since the 1995–96 season. The Magic finished the regular season 52–30, their best season since 1995–96. With the 3rd seed in the Eastern Conference, they were matched up in their first round playoff series against the Toronto Raptors. The Magic had home court advantage for the first time since the 1998–99 season. On April 28, 2008, at Amway Arena, the Magic eliminated the Raptors with a 4–1 series victory in the first round. It was the first playoff series victory for the Magic in 12 years after 6 straight first round exits. The run of success did not last long as they fell 4–1 to the experienced Detroit Pistons in the second round. With the Magic already down in the series, controversy erupted after the Pistons' Game 2 victory. At the conclusion of the 3rd quarter, Chauncey Billups of the Pistons made a three-point shot giving the Pistons a three-point lead. However, the clock had stopped just as the play began. NBA rules prohibit officials from using instant replay or any timing device to determine how much time has elapsed when a clock malfunctions, nor is a replay allowed to be viewed from the time of the malfunction to when the play ends, when the game clock has not expired. Because of the rule, the officials then estimated that the play took 4.6 seconds, and because there were 5.1 seconds remaining when play began, the field goal was allowed to be counted. The NBA later admitted that the play actually took 5.7 seconds and the basket in question should not have counted. The Pistons went on to win Game 2. The Magic were able to win Game 3, with the Pistons' Chauncey Billups out for most of the game with an injury, but were unable to take advantage of his absence and defeat the Pistons in Games 4 and 5, which ended the Magic's playoff run in 2008. The first half of the 2008–09 season went very well for the Magic. After 41 games, the Magic were 33–8, leading the Southeast Division, as well as having one of the top four records in the league. 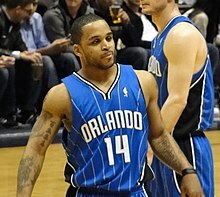 At the start of February, Jameer Nelson, their all-star starting point guard, went down with a shoulder injury. He was expected to miss the remainder of the season. After trading for Rafer Alston, the Magic finished the regular season with a 59–23 record, it was the most games the team had won in a season since the 1995–96 season in which they had 60 wins. In the playoffs, the Magic beat the Philadelphia 76ers in the first round of the playoffs and then the defending champions, the Boston Celtics, in the Eastern Conference semifinals, behind assistant coach Patrick Ewing's guarantee that they would win Game 7 of that series. In their first conference finals since 1996, the Magic beat the Cleveland Cavaliers, which were led by the season's MVP, LeBron James. After dropping the first two games in the Finals against the Los Angeles Lakers, the Magic finally won their first ever game in the Finals in Game 3. Despite Nelson's return to the team for the Finals, the Lakers won the series and the championship by beating the Magic in five games. In the 2009 off-season, Orlando traded Rafer Alston, Tony Battie, and Courtney Lee to the New Jersey Nets in exchange for eight-time All-Star Vince Carter and Ryan Anderson. Hedo Türkoğlu, as part of a sign-and-trade, was sent to the Toronto Raptors. They then made several free agent signings. On July 10, former Dallas Mavericks power forward Brandon Bass was given a 4-year deal. On July 21, the Magic signed former Phoenix Suns forward Matt Barnes. On August 19, they signed former Miami Heat point guard Jason Williams. On September 28, 2009, Orlando extended the contract of head coach Stan Van Gundy by exercising his option for the 2010–11 season. They did the same for general manager Otis Smith, which would keep him in that position through the 2011–12 season. The Magic were without Rashard Lewis for the first 10 games of the 2009–10 season. Lewis tested positive for an elevated testosterone level that was caused by an over-the-counter supplement containing a substance banned by the league. To make matters worse, Vince Carter suffered a left ankle injury in just the second game of the season. Carter's injury turned out to be not too serious, but caused him to miss the next five games. Another setback came in mid-November, when Jameer Nelson injured his left knee, which required arthroscopic surgery to repair. Nelson would be out for five weeks. Despite all of this, the Magic had a 23–8 record at the end of December. Orlando lost seven of their first ten games in January, but recovered well enough to post a winning record for the month by winning six of their next seven. Following the All-Star break, the Magic went on a roll, winning 23 of their 28 remaining games, clinching their fourth consecutive playoff berth and winning their third consecutive division championship in the process. The Magic finished the regular season with a 59–23 record, matching their record from the 2008–09 season, and finishing with not only the second-best record in the Eastern Conference, but the second-best record in the entire league. The team became one of the only teams in NBA history to beat all of the other 29 teams at least once during the regular season. The Magic swept the Charlotte Bobcats and the Atlanta Hawks in the first two rounds of the playoffs, respectively. They then faced the Boston Celtics in the conference finals. After losing the first three games of the series, Orlando managed to win the next two games, but lost on the road in Game 6, ending their season. 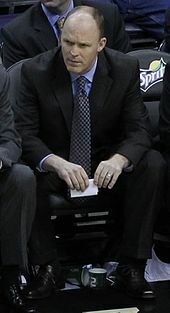 Scott Skiles coached the Magic in the 2015–16 season. In anticipation of the team's move to Amway Center, the Magic updated its logo. They retained the streaking ball logo, but changed the wordmark taken from their current uniforms. The Magic hosted the NBA All-Star Game in 2012. The Magic also unveiled black alternate uniforms. In the summer of 2010 the Orlando Magic signed Chris Duhon, formerly of the New York Knicks, and Quentin Richardson, formerly of the Miami Heat. On December 18, 2010, having lost five of their last six games, the Magic made a blockbuster trade deal with the Phoenix Suns and the Washington Wizards. They traded Vince Carter, Marcin Gortat and Mickaël Piétrus to Phoenix for Hedo Türkoğlu (who led them into the 2009 NBA Finals when they lost 4–1 against the Los Angeles Lakers), Jason Richardson and Earl Clark. Rashard Lewis was traded to Washington for 3-time All-Star Gilbert Arenas. The Magic finished the season with 52 victories, good for 2nd in the Southeast Division. But they were ousted in six games by the Atlanta Hawks in the first round of the 2011 NBA Playoffs, the first time head coach Stan Van Gundy was eliminated early in the playoffs. In a shortened 2012 season, due to the NBA Lockout, the Magic started the offseason on a rocky note, with their All-Star center, Dwight Howard, requesting a trade to either the New Jersey Nets, Los Angeles Lakers, or Dallas Mavericks. Overlooking the trade request the Magic did a sign and trade with the Boston Celtics for Glen Davis and Von Wafer in exchange for Brandon Bass. The Magic also amnestied Gilbert Arenas and signed Larry Hughes, Justin Harper, and DeAndre Liggins. The Magic started the season on Christmas Day in Oklahoma City against the Thunder. They lost the season opener 89–97. During the month of February, the Magic waived Hughes and signed Ish Smith. On February 26, Orlando hosted the 2012 All-Star Game. The Magic struggled to win games consistently, with concerns about the uncertainty of Dwight Howard's future with the franchise. However, after Dwight rescinded his trade demand and signed a one-year deal in March, the Magic seemed to find their footing again. But then in early April, shortly after it became public that Howard requested coach Van Gundy to be replaced, the center was diagnosed with a herniated disk and forced to have back surgery, thus ending his season. The Magic clinched the sixth seed in the east with a 37–29 record. The Magic were faced with the third seeded Pacers in the first round. Despite winning the first game of the series the Magic were defeated 4–1. On May 21, 2012, it was reported that general manager Otis Smith and head coach Stan Van Gundy would part ways with the organization. Stan Van Gundy finished with a 259–135 regular season record with the team which included making the playoffs in those five years and a conference championship. CEO Alex Martins announced former Oklahoma City assistant general manager Rob Hennigan as the new general manager for the Orlando Magic on June 20, 2012. Once hired, he became the youngest general manager in the league. In the 2012 NBA draft, the Magic selected Andrew Nicholson and Kyle O'Quinn. On June 25, 2012, Dwight Howard had face-to-face meeting with general manager Rob Hennigan in Los Angeles and demanded a trade to the Brooklyn Nets. On July 9, 2012, the Magic completed a sign-and-trade deal with the New Orleans Hornets, that sent forward Ryan Anderson to the Hornets. In return the Magic received center Gustavo Ayon. On July 28, 2012, Jacque Vaughn was named the new head coach. He had been the assistant coach for the San Antonio Spurs for the last two seasons. On August 9, 2012, ESPN reported that a four-team trade would send Dwight Howard to the Los Angeles Lakers. ESPN.com's Marc Stein was told the Lakers were to acquire Howard, Chris Duhon and Earl Clark, the Denver Nuggets were to acquire Andre Iguodala, the Philadelphia 76ers were to acquire Andrew Bynum and Jason Richardson, and the Magic were to acquire Arron Afflalo, Al Harrington, Nikola Vučević, Maurice Harkless, Josh McRoberts, Christian Eyenga, and five total protected future (three 1st round, two 2nd round) picks from each of the other three teams. The deal was officially confirmed and completed on August 10. Howard left the Magic as their all-time leading scorer, shot blocker, and rebounder. Aaron Gordon selected by the Magic in the 2014 NBA draft. Following the trade of Dwight Howard, the Magic entered into a state of rebuilding with Maurice Harkless and Nikola Vučević. On August 29, the Magic signed free agent guard E'Twaun Moore. On December 2, 2012, Howard's first game against his former team, the Magic defeated the Lakers 113–103. 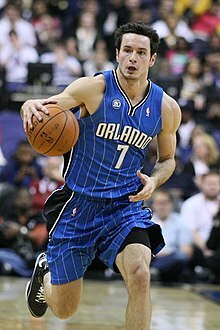 On February 21, 2013, the Magic traded JJ Redick, Ish Smith and Gustavo Ayón to the Milwaukee Bucks. In return, the Magic received Beno Udrih, Tobias Harris and rookie Doron Lamb. The Magic also traded Josh McRoberts to the Charlotte Bobcats for Hakim Warrick who was waived 2 days later. The Magic finish the 2012–2013 season 20–62 as the worst record in the NBA, missing the playoffs for the first time since 2006. On June 27, 2013, the Orlando Magic had the 2nd pick in the 1st round of the 2013 NBA draft. The Magic used their lottery pick to draft Big Ten Defensive Player of the Year, shooting guard Victor Oladipo from Indiana University. The Orlando Magic also had the 51st pick in the 2nd round of the NBA draft. They used this pick to draft 6'8" forward Romero Osby from the University of Oklahoma. Osby averaged 16 points, 7 rebounds, and 1.3 assists during his senior NCAA season at Oklahoma, but was cut by the Magic before the season opener. The Magic finished the 2013–2014 season with a 23–59 record, 3rd worst in the NBA. The draft lottery gave them the 4th pick in the 2014 NBA draft. In the draft, they selected Aaron Gordon with the 4th pick and Dario Šarić with the 12th pick. Saric was then swapped for the 10th pick, Elfrid Payton in exchange for a 2017 1st round pick and a future 2nd round pick. Roy Devyn Marble was selected with the 56th pick in the 2nd round. On February 5, 2015, Jacque Vaughn was relieved of his head coaching duties after coaching 2½ seasons for the Magic. His overall record was 58–158. He was replaced by interim head coach James Borrego. On May 29, 2015, the Magic hired their former point guard Scott Skiles as the franchise's 12th head coach. On June 25, 2015, in the 2015 NBA draft, Orlando selected Mario Hezonja with the fifth overall pick and Tyler Harvey with the 51st overall pick. On February 16, 2016, the Magic traded Tobias Harris to the Detroit Pistons in exchange for Ersan İlyasova and Brandon Jennings. On May 12, 2016 Skiles stepped down as head coach of the Orlando Magic. On May 19, the Orlando Magic agreed to a deal with former Indiana Pacers coach Frank Vogel to become the next head coach of the team. With Vogel as their new coach, the Magic made many changes to their roster during the offseason. On June 23, 2016, in the 2016 NBA draft the Magic selected Domantas Sabonis 11th overall, but then traded Sabonis and shooting guard Victor Oladipo for defensive power forward Serge Ibaka of the Oklahoma City Thunder. During free agency the Magic re-signed Evan Fournier to a five-year, $85 million contract and also signed Bismack Biyombo, Jeff Green, and D. J. Augustin. On July 15, C. J. Wilcox was acquired, along with cash considerations, from the Clippers in exchange for Devyn Marble and a future second round draft pick. On February 14, 2017, Ibaka was traded to the Toronto Raptors in exchange for Terrence Ross and a future first-round draft pick. The Magic finished the 2016–17 season with the third worst record in their conference, finishing 29–53. In the summer of 2017, the Magic made various changes, the first being the firing of general manager Rob Hennigan on April 13. On May 23, the Magic named Jeff Weltman, the former general manager of the Toronto Raptors, as president of basketball operations and named John Hammond, the former general manager for the Milwaukee Bucks, as the new general manager. With the sixth overall pick in the 2017 NBA Draft, Orlando drafted Florida State forward, Jonathan Isaac. During free agency the Magic signed Jonathon Simmons, Arron Afflalo, Shelvin Mack, Marreese Speights, Khem Birch and Adreian Payne. On October 6, 2017, the Magic announced that former superstar Tracy McGrady, had rejoined the team as assistant to the CEO. On April 12, 2018, head coach Frank Vogel was fired by the Magic after the conclusion of the 2017–18 regular season. On May 30, the Magic named Steve Clifford as their new head coach. On June 21, 2018, the Magic drafted center Mohamed Bamba with the sixth overall pick. On September 6, 2018, team owner Richard DeVos died aged 92 from complications from an infection. During the 2018–19 season, the Magic won their sixth division title and finished in seventh place in the Eastern Conference to clinch a playoff berth for the first time since the 2011–12 season. The team's current home arena, the Amway Center, officially opened on October 1, 2010. The Orlando Magic hosted their first preseason game at Amway Center on October 10 against the New Orleans Hornets. The 2010–11 regular season home opener was on October 28 against the Washington Wizards, and the Magic won both games. In 2012, the Amway Center hosted the All-Star Weekend. At the time it opened, the new Amway Center was home to the largest Jumbotron in the NBA. The arena also features approximately 2,100 feet (640 m) of digital ribbon boards, and outside the building a 46 feet (14 m) by 53 feet (16 m) video display is visible to motorists traveling on Interstate 4. The Amway Center is also the home of the minor league hockey team, Orlando Solar Bears and the Orlando Predators of the Arena Football League (AFL). Originally called the Orlando Arena, and later TD Waterhouse Centre, the Amway Arena was the home of the Magic from 1989 to 2010. Amway Arena opened in 1989 and served as home to the Orlando Magic since their inception until the 2009–2010 season. It was originally known as the Orlando Arena, or the "O-Rena", during its first 10 years. In 1999, TD Waterhouse purchased the naming rights and named the venue the TD Waterhouse Centre. In December 2006, the naming rights were purchased by Amway for four years. It is also home of the Arena Football League's Orlando Predators, the Orlando Sharks of the Major Indoor Soccer League, and various sporting and entertainment events. Amway Arena was one of "The Orlando Venues" owned and operated by the City of Orlando. The other facilities include the Bob Carr Performing Arts Centre, Tinker Field, Camping World Stadium, Harry P. Leu Gardens, and Mennello Museum. Orlando advertising agency The Advertising Works, led by its president Doug Minear was responsible for the original Magic uniforms. The logo, featuring a basketball crowded by stars and the wordmark "Magic" with a star replacing the A, was created following meetings with Walt Disney World artists and over 5000 suggestions sent from around the country. Stars would remain a primary feature of the logo once it was redesigned in 2000 to feature a comet-like basketball. Pat Williams first suggested the colors black and gold of his alma mater Wake Forest, but this was eschewed for various factors, including the local college Central Florida using the same scheme. Black would still be the primary color in the scheme used by Minear, a trait shared by 16 other NBA teams. Other colors were an electric blue specially made by sporting goods manufacturer MacGregor, and silver. The home uniforms were white with black pinstripes, featuring black numbers with blue trim, and the road jerseys reversed the scheme while featuring "Orlando" instead of the Magic logo. Given the standard mesh nylon worn across the NBA did not allow for pinstripes, the jerseys were made out of durene, a material with cotton on the underside and polyester bonded on the outside. The road uniform was changed to blue with white pinstripes in 1994–95. For the Magic's 10th anniversary in 1998, a new look designed by fashion designer Jhane Barnes was unveiled. The pinstripes were dropped and the uniforms now featured stars as the background. Both jerseys, made out of the dazzle that was used in the Women's National Basketball Association uniforms, had the Magic logo, with the home jersey in white and the away in blue. The Magic's 15th anniversary in 2003 inspired another uniform revamp, opting for a cleaner look without stripes or stars. The home jerseys were white and the Magic logo was blue with silver and black trim. The away jersey reverted to the city name, and was blue. The logo and numbers are white with black trim. For the 2008–09 season, the Magic have once again introduced new uniforms. The Magic returned to the pinstriped uniforms to commemorate the team's 20th anniversary. The current design combines the elements of the previous three uniform designs the Magic used in its 20-year history. The home jerseys are white with silver pinstripes, while the away jerseys are blue with white pinstripes. The font used for the number and player/team name has also been updated to a more modern look. Magic alternate logos are on the shorts and the back of the jersey. This is the fourth model in franchise history. As the Magic moved to the Amway Center in 2010, they unveiled a new logo that for the first time fully spelled "Magic", without the star instead of the A. They also unveiled a black alternate uniform, with silver pinstripes, mirroring the regular blue road uniform. They were usually worn as throwback uniforms as part of the NBA Hardwood Classics program. A variation of the uniform is also used for Noche Latina every March, with 'Orlando' substituted for 'El Magic', with 'El' in black and silver trim and 'Magic' in blue and silver trim. This was unveiled in the 2011–12 season. In 2014, Magic unveiled a silver uniform for the first time in their history. It was sleeved, and featuring white pinstripes along with blue, black and white trim for the letters and numbers. Unlike the three other uniforms, a different striping pattern will be used on the sides. In 2016, The Magic unveiled a third alternate uniform, featuring carbon as the primary color and without pinstripes. Named “Stars”, it featured the team's secondary logo and a blue, white and blue tricolor stripe in front, along with white lettering. The Magic made only a few slight tweaks to their uniforms when Nike became the league's uniform provider in 2017. The home and away uniform designations were abolished, thus the Magic's white "Association" and blue "Icon" uniforms are now used either at home or on the road. The Magic also retained their black alternate uniform as part of Nike's "Statement" line, although the pinstripes changed from silver to blue. Their jersey's sponsor is Disney. An annual "City" edition is also utilized by Nike to honor either local culture or team tradition. The Magic's 2017–18 "City" uniform featured a printed pattern of stars in the sky along with the team's alternate logo in front. For the 2018–19 season, the Magic only made slight changes to their "City" uniform, with the printed pattern of stars relegated to the sides and a predominantly black base. The Magic are one of seven teams to wear "Classic" uniforms for the 2018–19 season. As part of their 30th anniversary, the team unveiled the uniform similar to those worn from 1994 to 1998. Stuff with the Orlando Magic Dancers. Stuff the Magic Dragon has been the Magic's mascot since 1989. A dragon designed by Wade Harrison and Bonnie Erickson of Acme Mascots, Inc, his name is a pun on Puff the Magic Dragon, and how a slam dunk is also known as "stuffing". The Magic hold the draft rights to the following unsigned draft picks who have been playing outside the NBA. A drafted player, either an international draftee or a college draftee who is not signed by the team that drafted him, is allowed to sign with any non-NBA teams. In this case, the team retains the player's draft rights in the NBA until one year after the player's contract with the non-NBA team ends. This list includes draft rights that were acquired from trades with other teams. 1 The number was unretired in the 2001–02 season for Patrick Ewing. 1 In total, Ewing was inducted into the Hall of Fame twice – as player and as a member of the 1992 Olympic team. Also served as assistant coach in 2007–2012. In 2014, the Orlando Magic launched the team's Hall of Fame, which honors players, coaches and executives who have had a major impact for the team. The Atlanta Hawks and the Orlando Magic had an intense rivalry, mostly stemming from playoff competitions and the rising stardom of Dwight Howard and Josh Smith, both from the 2004 NBA draft and who were both raised in Georgia. The two teams faced each other three times in the 1996, 2010, and 2011 NBA playoffs. The Magic defeated the Hawks in the second round of the 1996 playoffs 4–1, and swept the second round series 4–0 in the 2010 playoffs, while the Hawks eliminated the Magic 4–2 in the first round of the corresponding 2011 playoffs. The current television announce team for the Orlando Magic is play-by-play announcer David Steele and color analyst Jeff Turner. Turner played for the Magic from its inaugural 1989 season to 1996. Paul Kennedy and Dante Marchetelli serve as courtside reporters, while Marchetelli, former coach Brian Hill, and former Magic player Nick Anderson host the pre-game, halftime and post-game shows. Television broadcasts were split in 2007–08 between Fox Sports Florida and Sun Sports (now Fox Sports Sun). In the 18 years before then, broadcasts were split between Sun Sports (formerly known as the Sunshine Network) and local television stations, originally WKCF and, later, WRBW. There was a controversy with moving broadcasts to Fox Sports Florida since Orlando's largest cable TV provider, Bright House Networks, did not carry the network. Pressure increased for the cable provider to pick up FS Florida in time for the 2007–08 NBA season but this did not happen. The Magic persisted with airing games on FS Florida into the 2008–09 season despite Bright House's refusal to pick up the channel in all of its affiliates. Recently, Bright House and FS Florida came to an agreement on January 1, 2009 and have begun airing the channel as part of its standard cable package. However, Bright House airs the channel using a digital signal that only allows customers who own the Digital cable box to receive the channel. The customers do not have to pay any additional costs to get the channel with their Digital cable box. As of the 2012–13 season, all Magic games are now on Fox Sports Florida. The current radio announce team for the Orlando Magic is play-by-play announcer Dennis Neumann and color analyst Richie Adubato, another former Magic head coach. Games are produced by Magic Radio Network flagship AM 580 WDBO in Orlando, and also broadcast on AM 1380 WELE in Daytona Beach, 99.5 FM WGMW "The Star" in Gainesville and Ocala, AM 1290 WPCF in Panama City, AM 1590 WPSL in Port St. Lucie and AM 1450 WSTU in Stuart. The affiliate in Tallahassee is AM 1270 "My 94.3" WTLY. The immediate Tampa Bay area has no affiliate although AM 1340 in Clearwater WTAN is listed on the team's website. The flagship broadcast was simulcast on WDBO-FM during the 2011–12 NBA season while that station moved from AM to FM. When WDBO-AM re-formatted from talk radio to sports radio, it retained the flagship status. However, WDBO-FM still simulcasts Magic games in Central Florida. Joey Colon and Ramón Rivas do Spanish-language commentary on AM 1030 WONQ "La Grande" in Orlando. The official Orlando Magic website features a collection of podcasts available on iTunes, including "Magic Overtime with Dante and Galante". ^ "NBA.com/Stats–Orlando Magic seasons". Stats.NBA.com. NBA Media Ventures, LLC. Retrieved January 29, 2017. ^ "History: Team by Team" (PDF). 2018-19 Official NBA Guide. NBA Properties, Inc. October 8, 2018. Retrieved February 28, 2019. ^ "Orlando Magic Unveil New Logo". OrlandoMagic.com. NBA Media Ventures, LLC. June 15, 2010. Retrieved May 20, 2016. The new logo incorporates the Magic's current jersey wordmark giving a more integrated look. It also continues the team's colors with the Magic blue, Magic black and Magic silver. ^ "Orlando Magic Reproduction Guideline Sheet". NBA Properties, Inc. Retrieved December 22, 2017. ^ "Disney Believes in Magic". OrlandoMagic.com (Press release). NBA Media Ventures. June 20, 2017. Retrieved December 17, 2017. ^ Denton, John (May 23, 2017). "Magic Name Jeff Weltman President of Basketball Operations". OrlandoMagic.com. NBA Media Ventures, LLC. Retrieved May 24, 2017. ^ Denton, John (May 23, 2017). "Magic Name John Hammond General Manager". OrlandoMagic.com. NBA Media Ventures, LLC. Retrieved May 24, 2017. ^ a b c Galarza, Carlos (July 6, 2006). "Magic moments: 20 years since NBA idea was born". Orlando Business Journal. Retrieved December 26, 2013. ^ Lombardo, John (February 11, 2013). "Magic Man". Sports Business Journal. Retrieved December 26, 2013. ^ "MAGIC: Behind the Name: the Orlando Magic". NBA.com/magic. Retrieved March 9, 2008. ^ "MAGIC: 20 Years Ago Today – The Magic Begins". NBA.com/magic. Retrieved March 9, 2008. ^ "History of team names in the NBA". Retrieved June 30, 2015. ^ Cooper, Barry (July 27, 1986). "Abracadabra! It's Magic Orlando's Prospective Nba Team Now Has A Name". Orlando Sentinel. Retrieved June 30, 2015. ^ "The Origins of All 30 NBA Team Names". October 14, 2016. ^ a b Lombardo, John (February 11, 2013). "Stern: Pat 'refused to take no for an answer'". Sports Business Journal. Retrieved December 26, 2013. ^ Blumenstyk, Goldie (December 9, 1986). "Gung-ho City Council Okays Early Construction Of Arena". Retrieved December 26, 2013. ^ a b Goldaper, Sam (April 23, 1987). "The National Basketball Association decided yesterday in a surprise move to expand by four franchises rather than the three originally planned". The New York Times. Retrieved March 10, 2008. ^ Dunlap, Evan (November 1, 2013). "Orlando Magic 25th anniversary: Team to honor Nick Anderson on November 8th". Orlando Pinstriped Post. Retrieved December 26, 2013. ^ Schmitz, Brian (October 29, 2011). "Dave Corzine has Magic flashback". Orlando Sentinel. Retrieved December 26, 2013. ^ a b c d e f g h Denton, John. "Denton: 25 Years of Magic History". NBA.com/magic. Retrieved March 10, 2016. ^ "1989–90 Standings". NBA.com/history. Retrieved March 10, 2008. ^ "NBA Expansion Drafts: Results". NBA.com/history. Retrieved March 10, 2008. ^ Dunlap, Evan (December 9, 2013). "Orlando Magic 25th anniversary: Team to honor Dennis Scott on December 13th". Orlando Pinstriped Post. Retrieved December 26, 2013. ^ "Scott Skiles: The Game I'll Never Forget". OrlandoMagic.com. NBA Media Ventures, LLC. December 30, 2005. Retrieved November 27, 2006. ^ "N.B.A. Orlando Team Sold". The New York Times. September 20, 1991. Retrieved March 10, 2008. ^ Moran, Malcolm (May 18, 1992). "The Top Pick Is Going to Disney World". The New York Times. Retrieved March 10, 2008. ^ "1992–93 Standings". NBA.com/history. Retrieved March 10, 2008. ^ a b Abrams, Jonathan. "Blue Chips: An oral history of Shaq, Penny, and the Orlando Magic's lost NBA dynasty". Grantland. ESPN. Retrieved December 7, 2016. ^ "Hill Is Named Coach of Magic". The New York Times. July 1, 1993. Retrieved March 11, 2008. ^ Thompson II, Marcus; Geoff Lepper (January 26, 2008). "Warriors in talks with Webber". San Jose Mercury News. Retrieved March 11, 2008. ^ "1993–94 Standings". NBA.com/history. Retrieved March 12, 2008. ^ "1994 Playoff Results". NBA.com/history. Retrieved March 12, 2008. ^ "1994–95 Standings". NBA.com/history. Retrieved March 12, 2008. ^ "Orlando Magic: Did You Know?". NBA.com/magic. Retrieved March 12, 2008. ^ "1995 Playoff Results". NBA.com/history. Retrieved March 12, 2008. ^ "1995–96 Standings". NBA.com/history. Retrieved March 12, 2008. ^ "MAGIC: All-Time Transactions". NBA.com/magic. Retrieved March 12, 2008. ^ "1996 Playoff Results". NBA.com/history. Retrieved March 12, 2008. ^ Smallwood, John (May 28, 1996). "Bull Rush Jordan, Chicago Sweep Past Magic Into Finals Jordan Is The Magic". Philadelphia Daily News. Retrieved December 26, 2013. ^ Heisler, Mark (July 19, 1996). "Lakers Hit The Shaqpot". Los Angeles Times. Retrieved December 26, 2013. ^ "Daly reconsiders, takes Magic job Former Pistons coach gets 3-year, $15 million deal". The Baltimore Sun. June 2, 1997. Retrieved December 26, 2013. ^ Povtak, Tim (February 20, 1998). "Seikaly Bounces To Nets, And It Looks As If He'll Go". Orlando Sentinel. Retrieved December 26, 2013. ^ Povtak, Tim (May 16, 1999). "76ers 101, Magic 91". Orlando Sentinel. Retrieved December 26, 2013. ^ Smith, Stephen A. (June 8, 1999). "Oakley Shows Interest In Sixers; Magic Hire Rivers As Head Coach". Philadelphia Daily News. Retrieved December 26, 2013. ^ "Suns Sign Penny For 7 Years". CBS News. August 4, 1999. Retrieved December 26, 2013. ^ "Hornets make Magic disappear". Philadelphia Daily News. May 1, 2002. Retrieved December 26, 2013. ^ "We Reminisce: When Tracy McGrady Almost Made The Second Round Of The NBA Playoffs 10 Years Ago". April 29, 2013. ^ Schmitz, Brian (November 18, 2003). "Magic Fire Coach Doc Rivers". Orlando Sentinel. Retrieved December 26, 2013. ^ "Gabriel blamed for Grant Hill fiasco". ESPN.com. March 12, 2004. Retrieved December 26, 2013. ^ Schmitz, Brian (June 30, 2004). "Exit T-mac, Enter Steve Francis . . .the 7-player Trade With Houston Is Final. Tracy Mcgrady Didn't Want To Leave Here". Orlando Sentinel. Retrieved December 26, 2013. ^ "Magic Acquire Tony Battie, Picks from Cleveland". OrlandoMagic.com. NBA Media Ventures, LLC. July 23, 2004. Retrieved December 26, 2013. ^ a b "2004–05 Season". OrlandoMagic.com. NBA Media Ventures, LLC. Retrieved December 28, 2013. ^ "Magic will waive Christie". ^ "Magic fire Davis following sixth straight loss". ESPN.com. March 17, 2005. ^ "Magic GM & COO John Weisbrod Resigns; Is Move To NHL Next?". Sports Business Daily. May 23, 2005. Retrieved December 28, 2013. ^ "Brian Hill named Orlando Magic coach". UPI. May 24, 2005. Retrieved December 28, 2013. ^ "Sonics, Magic complete sign-and-trade for Rashard Lewis". ESPN. Retrieved June 30, 2015. ^ "Magic's Vander Weide officially takes over reins from owner Rich DeVos". tribunedigital-orlandosentinel. Retrieved June 30, 2015. ^ "After review, NBA says Billups' 3-pointer should not have counted". ESPN. Retrieved June 30, 2015. ^ Golen, Jimmy (May 18, 2009). "Magic Moment: Orlando beats Boston to advance". Yahoo. Associated Press. ^ "New Jersey Nets ship Vince Carter to Orlando Magic for Rafer Alston, rookie Courtney Lee". ESPN. Retrieved June 30, 2015. ^ "Magic Sign Free Agent Brandon Bass". OrlandoMagic.com. NBA Media Ventures, LLC. Archived from the original on July 14, 2009. Retrieved February 28, 2019. ^ "Orlando Magic agree to two-year contract with free-agent forward Matt Barnes". ESPN. Retrieved June 30, 2015. ^ "Magic Sign Free Agent Jason Williams". Retrieved June 30, 2015. ^ "Van Gundy, Smith reap the rewards of success". tribunedigital-orlandosentinel. Retrieved June 30, 2015. ^ "Lewis suspended 10 games by NBA". ESPN. August 7, 2009. Retrieved April 13, 2010. ^ "Magic sign Chris Duhon". InsideHoops. Retrieved January 27, 2013. ^ "Sources: Magic trade for Gilbert Arenas". ESPN. December 18, 2010. Retrieved December 18, 2010. ^ "Orlando Magic GM Rob Hennigan –". Usatoday.com. June 20, 2012. Retrieved January 27, 2013. ^ "Dwight Howard Demands Nets Trade". CBS New York. Retrieved July 1, 2012. ^ "Jacque Vaughn named as Magic head coach". WFTV Channel 9 Orlando. Retrieved July 28, 2012. ^ "Dwight Howard to Lakers". ESPN. Retrieved August 10, 2012. ^ "It's official: Howard dealt to Lakers in four-team trade". NBA. August 10, 2012. Archived from the original on August 11, 2012. Retrieved August 10, 2012. ^ "Big Ten Announces 2013 Men's Basketball Postseason Honors". www.bigten.org. March 11, 2013. Retrieved June 28, 2013. ^ Hightower, Kyle (May 29, 2015). "Magic tab Skiles as 12th coach in franchise history". National Basketball Association. Retrieved August 15, 2015. ^ "Magic hire Scott Skiles as coach". ESPN. May 29, 2015. Retrieved August 15, 2015. ^ Denton, John (June 25, 2015). "Magic Select Mario Hezonja with Fifth Overall Pick". NBA.com. Retrieved June 26, 2015. ^ "Detroit Pistons Acquire Forward Tobias Harris". NBA.com. Turner Sports Interactive, Inc. February 16, 2016. Retrieved February 16, 2016. ^ Robbins, Josh (May 12, 2016). "Scott Skiles resigns as head coach of Orlando Magic". Orlando Sentinel. Retrieved May 12, 2016. ^ "Source: Magic agree to deal with Vogel as coach". ^ "Orlando Magic Re-Sign Evan Fournier | Orlando Magic". Retrieved July 12, 2016. ^ Robbins, Josh (July 7, 2016). "Orlando Magic re-sign Evan Fournier". Orlando Sentinel. Retrieved July 12, 2016. ^ "Magic Acquire C.J. Wilcox From Clippers". NBA.com. July 15, 2016. Retrieved July 15, 2016. ^ "Raptors Acquire Serge Ibaka From Magic". NBA.com. February 14, 2017. Retrieved February 14, 2017. ^ Denton, John (April 12, 2018). "Orlando Magic Dismiss Frank Vogel as Head Coach". NBA.com. Retrieved April 12, 2018. ^ "Orlando Magic Name Steve Clifford Head Coach". NBA.com. May 30, 2018. Retrieved May 30, 2018. ^ "Mo Bamba, known for wingspan, joins Magic as sixth overall pick". ESPN.com. June 21, 2018. Retrieved June 26, 2018. ^ "Richard M. DeVos, Co-Founder of Amway, Dies". NBA.com. September 6, 2018. Retrieved September 7, 2018. ^ Denton, John (April 7, 2019). "Magic Clinch Playoff Berth With Win Over Celtics". NBA.com. Retrieved April 11, 2019. ^ "NBA.com: Orlando to host 2012 All-Star Game in new arena". National Basketball Association. May 4, 2010. Archived from the original on June 26, 2015. Retrieved August 15, 2015. ^ "Daktronics Helps Orlando Magic Open Amway Center". ^ "Amway Center to Feature Daktronics Integrated Super System". ^ "Magic's Home Renamed 'Amway Arena'". Local6.com. Retrieved March 9, 2008. ^ "AMWAY ARENA". Orlando Venues. Retrieved March 9, 2008. ^ a b "Magic Logo Sparks Enthusiasm At Team's Colorful Unveiling". ^ Pat Williams, James D. Denney (2014). Ahead of the Game: The Pat Williams Story. Revell. p. 191. ISBN 1441220453. ^ a b "Suspense Over -- Magic Unveil Designer Duds". ^ "New-look Magic Leave Celtics Feeling Blue". ^ "Magic Unveil Latest In Nba Fashions". ^ "Going Retro: Orlando Magic". Orlando Magic. September 23, 2003. Retrieved August 15, 2015. ^ a b "Pinstriped Party". Orlando Magic. September 23, 2008. Retrieved August 15, 2015. ^ Dunlap, Evan (September 24, 2008). "Reviewing the Orlando Magic's New Uniforms". Orlando Pinstriped Post. Retrieved August 15, 2015. ^ "Orlando Magic 'turn the page,' unveil shocking new logo". ^ "Orlando Magic Unveil New Black Alternate Uniforms". Orlando Magic. November 26, 2010. Retrieved August 15, 2015. ^ Gates, Sara (February 29, 2012). "Orlando Debuts 'El Magic' Jersey For NBA's Noche Latina (PHOTOS)" – via Huff Post. ^ "Orlando Magic Unveil New Pride Jersey". Orlando Magic. September 29, 2014. Retrieved August 15, 2015. ^ "Orlando Magic Unveil New Stars Alternate Uniforms". Orlando Magic. August 9, 2016. Retrieved November 18, 2016. ^ "Orlando Magic Unveil New Threads from Nike". Orlando Magic. September 5, 2017. Retrieved September 16, 2017. ^ "Orlando Magic Unveil "City Edition" Threads from Nike". Orlando Magic. December 27, 2017. Retrieved February 3, 2018. ^ "Orlando Magic Unveil "City Edition" Uniform Inspired by Dreamers". Orlando Magic. November 1, 2018. Retrieved November 3, 2018. ^ Burry, Conrad. "Seven NBA Teams To Wear Classic Uniforms Next Season". sportslogos.net. Retrieved August 8, 2018. ^ Denton, John. "Orlando Magic Unveil 30 Years of Pure Magic". nba.com. Retrieved August 8, 2018. ^ "The Magic's Lovable Dragon Is The Stuff Of Team Dreams". ^ "Magic Continue to Add Length in Second Round". NBA.com. Turner Sports Interactive, Inc. June 22, 2018. Retrieved October 28, 2018. ^ "Magic Acquire Draft Rights to Jānis Timma; Trade Luke Ridnour". NBA.com. June 24, 2015. Retrieved June 24, 2015. ^ "Fran Vazquez: "I will jump to the NBA only when I feel ready"". HoopsHype.com. August 16, 2005. Retrieved February 4, 2015. ^ "Orlando Magic Announces Pat Williams and Nick Anderson as Inaugural Magic Hall of Fame Class". NBA.com. April 9, 2014. Retrieved January 26, 2017. ^ "Orlando Magic Hall of Fame". NBA.com. Retrieved January 26, 2017. ^ a b Denton, John (April 9, 2014). "Williams and Anderson Inducted Into Magic Hall of Fame". NBA.com. Retrieved January 26, 2017. ^ Denton, John (March 12, 2015). "Magic to Induct Shaq Into Magic Hall Of Fame". NBA.com. Retrieved January 26, 2017. ^ Denton, John (January 20, 2017). "Penny Hardaway Inducted Into Magic Hall of Fame". NBA.com. Retrieved January 26, 2017. ^ "Orlando Magic Senior Chairman Rich DeVos Inducted Into Magic Hall of Fame". NBA.com. March 29, 2016. Retrieved January 26, 2017. ^ a b "Orlando Magic Career Leaders". Basketball Reference. Retrieved April 13, 2019. Wikimedia Commons has media related to Orlando Magic.